wrapping paper for this coming Christmas. :) Merry Christmas to you! Exactly, Rebecca. I tend to do all my wrapping at once, so I got a bit inundated the other day. Of course, I still need to buy more! I just bought my paper Saturday and I STILL haven’t started. One of these night when the kids are asleep I’ll dive in. AH yes… beautiful wrapping paper! Perfectly poised and ready to cover each and every gift! Love. This is some of my scraps after my first round of wrapping. If only I were done with my gift buying! Thanks for linky up with us and the mention for Wordless Wednesday Bloggers. Lots of people don’t like wrapping, but I do! I think the pretty paper, bows, ribbons, etc. are great! I love wrapping! I’m not big on ribbons, but I love nicely designed wrapping paper and bows. Presentation counts! Very pretty paper! I love deco-inspired …..well, everything! Me too. I am very picky about my wrapping paper! Thanks for stopping by! So pretty! I love wrapping, tags and cards. Btw, if you run out of paper, magazine pages and old road maps make pretty cool wrapping too! Great idea, Tania. I’m running low! Love the way that looks Jennifer, great shot. holiday things like bows, ribbons, labels, bags and tape and such. I hate that! I’ve done the same thing. You’d think they would make the paper (or the bins) some sort of standard size. I still haven’t figured out a way to store bows without squishing them. That paper is beautiful!!! 🙂 Thanks for sharing! Rebecca Rider recently posted..Welcome, SITS Girls!! Thanks. Wish I had some more! 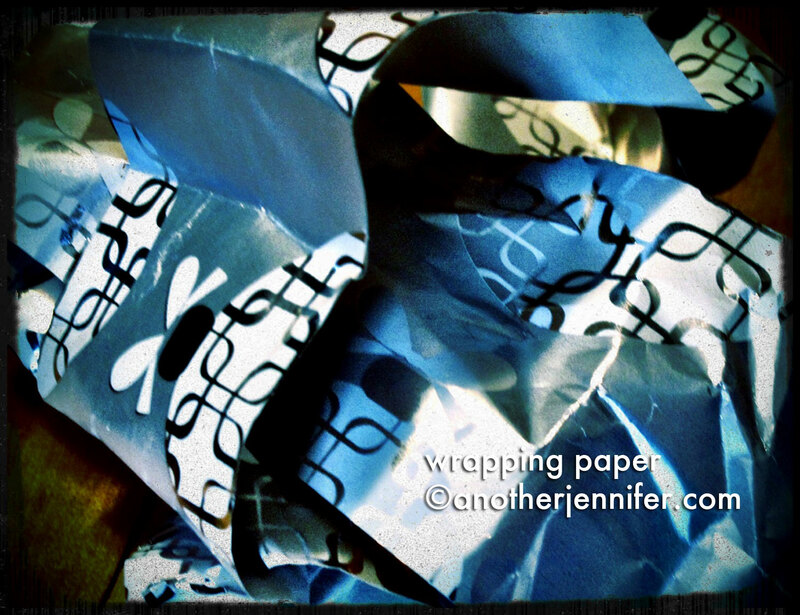 I love blue for holiday wrapping. It’s a really nice photo with the shadows and light. Thanks, Elinor! I always like paper that’s a little different. such a perfect reminder for the season of Christmas! HEHE . nice one! Thanks, Rebecca. Hope you had a great Christmas!